Once again, H. STOLL AG & Co. KG will be exhibiting at ISPO Munich on 3 - 6 February 2019, this year in cooperation with DITF (German Institute for Textile + Fiber Research). DITF as the largest European textile research center and STOLL present a fully automated production and development process out of a digitalized 3D CAD model. The combination of STOLL 3D flat knitting technology, the STOLL knitelligence® software package and the DITF automatization tool for processing 3D CAD models to 2D knitting data will influence future product development and production processes. The DITF is renowned for its research competence and pioneering role for industry 4.0 in the textile supply chain. STOLL provides state of the art 3D knitting technology and services for designers, product developers and textile manufacturers. 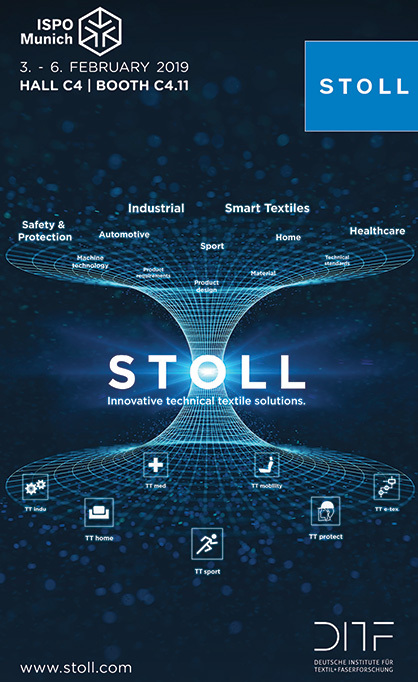 Together, the DITF and STOLL create fully automated and digital integrated process solutions as a milestone for industry 4.0 in a knitting environment. STOLL is looking forward to an interesting and successful exhibition. Come and visit STOLL on booth C4.11, Hall C4.